A phone paired with the InControl Apps platform is locked. JustDrive voice assistant can then be used. LOS ANGELES -- Drivers of new vehicles from Jaguar Land Rover soon can get a restaurant tip from Yelp or music from Spotify without opening an app on the dashboard, thanks to the automaker's work with a stealth Silicon Valley startup that sees voice recognition as the safest way to get smartphone functionality into the car. 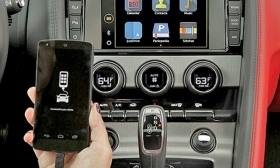 The interface it has developed, called JustDrive, represents an alternative to Google's Android Auto and Apple's CarPlay platforms, which aim to bring smartphone apps to the car dashboard while minimizing driver distraction. Jaguar Land Rover announced last week that JustDrive has been added to JLR's InControl Apps platform, which will be in all of its vehicles for the 2016 model year. The feature comes from CloudCar Inc., a Los Altos, California, company that had operated in near secrecy since its founding in late 2011. For years, automakers touted voice-recognition systems as a way to keep drivers from fiddling with phones and dashboard controls. But these systems have fallen far short of their promise, failing to understand certain accents or tripping up drivers with commands that have to be spoken in a precise order. Android Auto and CarPlay both use voice recognition, but CloudCar wants to go even further with JustDrive. Rather than tapping a touch screen to navigate through apps, the driver simply taps a button and speaks, using natural-language statements such as, "Take me to a good Lebanese restaurant that's on my route home." JustDrive interprets the instruction and accesses the user's phone apps to try to fulfill it, while learning the driver's habits and preferences over time. "Anytime you're messing around with the center stack trying to find the right app, or switching through all the different menus within the apps, you're not looking at the road," Luke Smithwick, CloudCar vice president of marketing and business development, said in an interview. Experts say that given skepticism over voice-based services, JustDrive may struggle to compete with Android Auto and CarPlay. Those systems are polished and similar to the standardized smartphone interfaces with which drivers are familiar. But the new system does have the advantage of speed to market. CloudCar and Jaguar started development this summer and finished in a matter of months, while other automakers struggled to complete the integration of the Android Auto and CarPlay platforms. JustDrive isn't a perfect solution. Drivers won't be able to use the push-to-talk button on the steering wheel to activate it just yet because its software lies on the wrong side of a firewall in Jaguar's onboard computers. But Jaguar is satisfied that it has struck a good balance. "You've got vehicle development and app development. They're two completely different life cycles," Peter Virk, head of connected technologies and apps at Jaguar, said in an interview. "We want to harness the innovation of apps."